Homemade Mayonnaise is such an easy recipe to make that it only takes a few minutes. This mayonnaise recipe turns out creamy and thick and tastes so good! Find out how my mayonnaise recipe turns out perfect every time. It has to do with both the mixing technique and the ingredients. Curious? This post may contain affiliate links. That means that I will earn a teeny tiny (seriously, it’s ridiculously small) commission on anything that you buy, at no added cost to you. By supporting me this way, I can deliver more homestead goodness! Read my disclosure policy here. Pin it to your FAVORITE RECIPE BOARD to SAVE it for later! Follow Ten Acre Baker on Pinterest for more ideas on chickens, goats, gardening, DIY projects, and farm to fork recipes! If you had told me when I was a kid that when I was an adult I would be making my own Homemade Mayonnaise using eggs from my own chickens, I would have said you were crazy. Yes, life is never what you expect, but I am thrilled with my mayonnaise-making chicken-raising life. I’ve been a Best Foods girl my whole life. As an adult, I switched over to Trader Joe’s mayonnaise and occasionally I would spring for the really expensive avocado oil mayonnaise that they sell at Costco. It never even occurred to me to make my own until a good friend of mine showed me how she makes hers. I was pretty intimidated by the process, but it really couldn’t be easier to make. 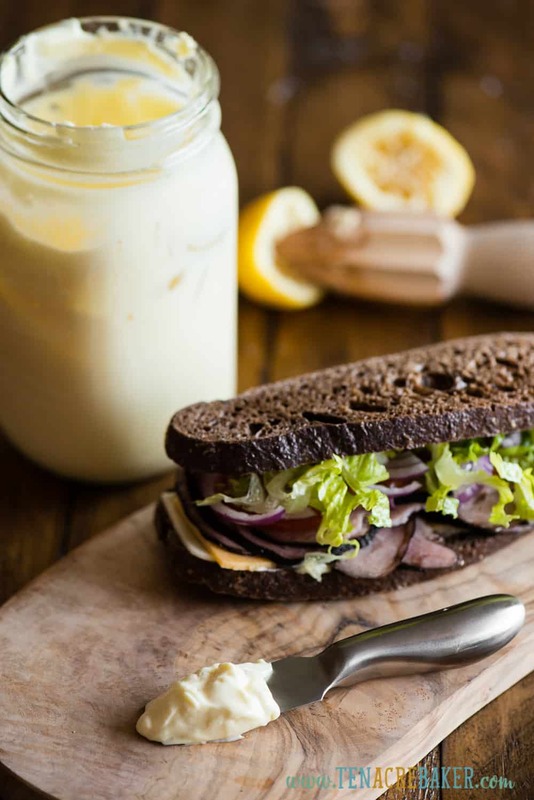 Taste – Homemade mayonnaise tastes really good. You can add just the right amount of lemon, salt, vinegar, and mustard powder to get it exactly how you want it. Just be sure to remember exactly how you made it so you can recreate your delicious mayonnaise again when you run out. With store bought mayonnaise, you get what you get. Homemade mayonnaise will taste exactly how you want it to taste. Cost – I’ve seen a 12 ounce jar of avocado oil mayonnaise cost over $10. That’s only 1 1/2 cups. My homemade mayonnaise recipe makes about 3 cups (twice the amount) and costs about $2 to make. Granted, I don’t use avocado oil, but if I did it still wouldn’t cost more than a couple bucks. If you’re a family who likes to mix mayo in with tuna, egg salad, potato salad, etc. or make your own ranch dressing, the cost of store bought mayonnaise can really add up quickly. Quality – When you control the ingredients, you control the quality of the mayonnaise. I like to use super fresh backyard chicken eggs. I know my chickens are well cared for and produce outstanding eggs, so why wouldn’t I want to put them in my homemade mayonnaise recipe? Also, tons of store bought mayonnaise uses soybean oil which I would prefer not to eat. 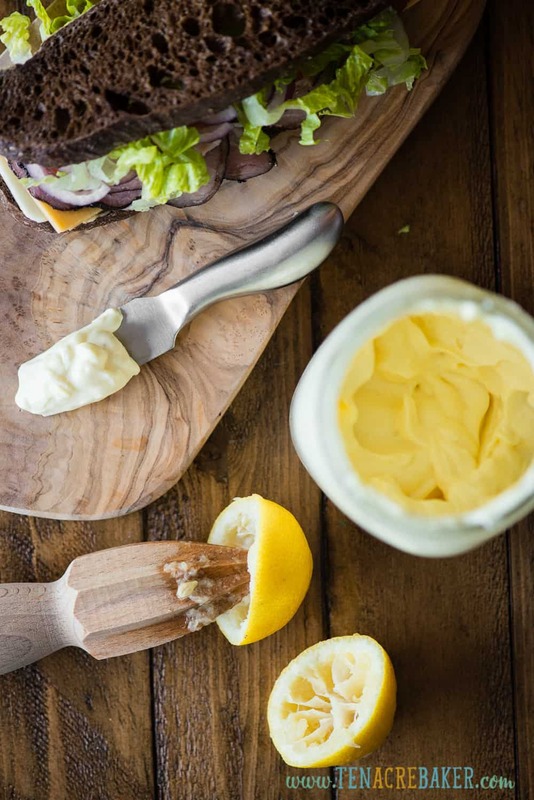 Is homemade mayonnaise safe to eat? Ask 10 different people and you’ll get 10 different answers. I’ve been eating raw egg my entire life (hello, cookie dough?) and have never gotten sick. Eating raw eggs doesn’t make you sick. Eating Salmonella will make you sick. Fresh eggs, even those with clean, uncracked shells, may contain bacteria (i.e. Salmonella). That is why so many people are hesitant to eat raw eggs. I’m not going to tell you it is safe to eat homemade mayonnaise, but I will tell you that my entire family eats homemade mayonnaise and we have never once been sick. I am very careful to only use fresh eggs that have been thoroughly washed prior to cracking them open. Is mayonnaise good or bad for you? Again, ask 10 different people and you’ll get 10 different answers. In my opinion, I do think mayonnaise is good for you. Especially homemade mayonnaise. Good quality eggs are regarded a ‘complete’ source of protein as they contain all nine essential amino acids; the ones we cannot synthesize in our bodies and must obtain from our diet. Olive oil is rich in healthy monounsaturated fats, among tons of other health benefits. The only downside is there is a lot of fat in mayonnaise, but everything in moderation is the key! My homemade mayonnaise is made out of fresh whole eggs, extra lite olive oil, ground mustard, distilled vinegar, lemon juice, and salt. You can use other oils including avocado and vegetable oil, if you prefer. You can use classic yellow mustard, dijon, or spicy brown mustard in lieu of the ground mustard. Also, you can use apple cider vinegar in place of the distilled vinegar. The options are endless, but this recipe is honestly the best recipe for just regular homemade mayonnaise. You can transform your mayonnaise into a fancy aioli by adding things like herbs, chipotle peppers, roasted garlic – you name it! Which oil is best for mayonnaise? After much trial and error, I am a firm believer that lite olive oil is the best oil for mayonnaise. I learned this from a friend of a friend. I’ve made plenty of mayonnaise and homemade aioli using extra virgin olive oil, avocado oil, and even vegetable oil. The only oil that made perfect homemade mayonnaise every single time was lite olive oil. Yes. When you’re on a ketogenic diet, mayo is a helpful way to eat more fat. 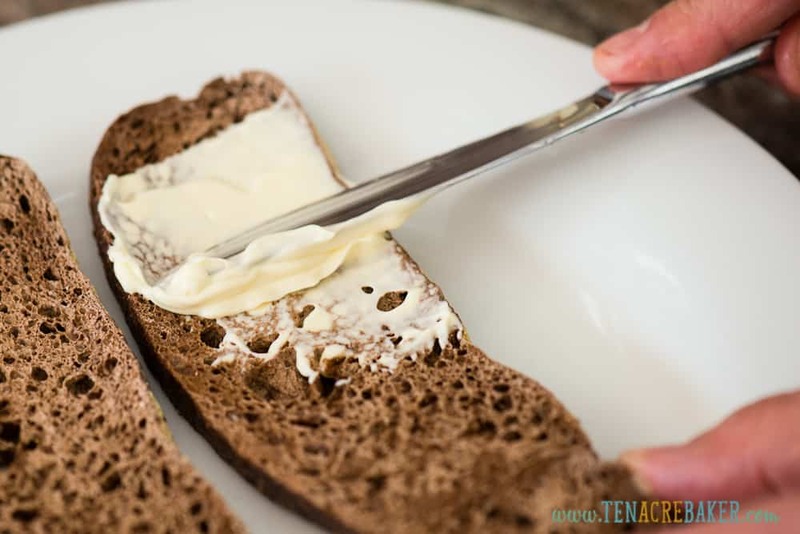 Mayonnaise is high in fat and very low in carbs – a keto diet dream! 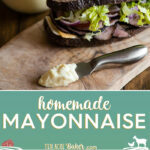 Homemade mayonnaise is even better because you know you won’t find any sugar in this recipe! If using an immersion blender, add your whole eggs, vinegar, lemon juice, salt, and mustard powder to a wide mouth mason jar. If you don’t have an immersion blender, you can add all of these ingredients to a blender or a food processor. Blend until the eggs emulsify and the mixture is cohesive. Slowly pour in a thin steady stream of olive oil while continuing to blend the entire time. Once all of the oil has been added and everything is fully mixed, taste and add additional salt, lemon, mustard, or vinegar, if desired. Watch the recipe video of me making homemade mayonnaise below! Homemade Mayonnaise is such an easy recipe to make that it only takes a few minutes. 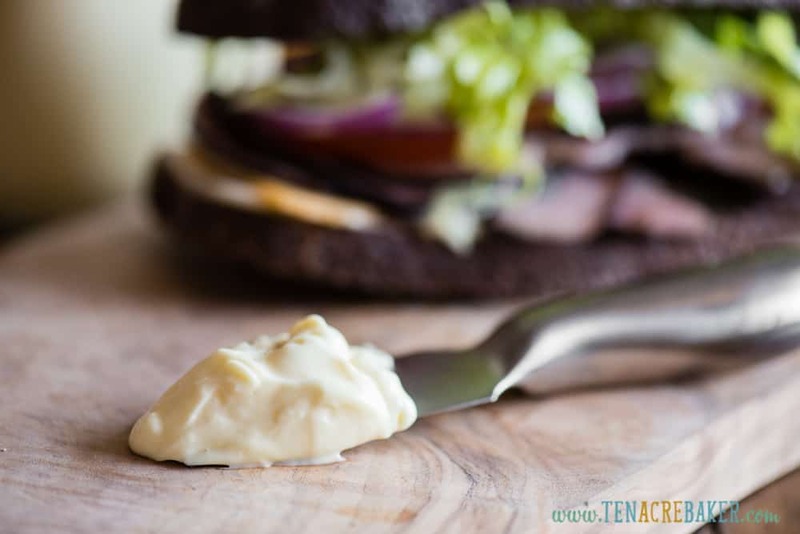 This mayonnaise recipe turns out creamy and thick and tastes so good! Add eggs, lemon juice, salt, vinegar, and ground mustard to a wide mouth mason jar. Use immersion blender to blend until mixture has emulsified and it starts to look creamy. With a slow steady stream, add the oil while continually blending and moving the immersion blender around to fully mix. Once all of the oil has been added and the mayonnaise is fully blended, taste and add more lemon, salt, and/or mustard powder, if necessary. If the mayo tastes really creamy and oily, I generally keep adding more salt and lemon until it tastes like the mayo I'm used to. This recipe makes about 3 cups of mayonnaise. Serving size based on 1 Tablespoon (for nutritional info). Homemade mayonnaise will keep in the refrigerator for about 1-2 weeks. Love talking about farm to fork recipes, gardening, chickens, goats, DIY projects and the like? We have a group that’s just for you! I invite you to join! We’re building a fun homestead-loving community!! !